"Schmiere - Pomade rock-hard" for very strong and illegal feathers - for your "feathers" always staying gorgeous and keeping their shape! Our new pomade isn't only useful on Alcatraz! Its lifelong hold brings you peaceful nights if you're hands may be tied for a longer time. Nice extra: now you can use our pomade as an escape aid in case of the new composition with the exclusive secret ingredient! 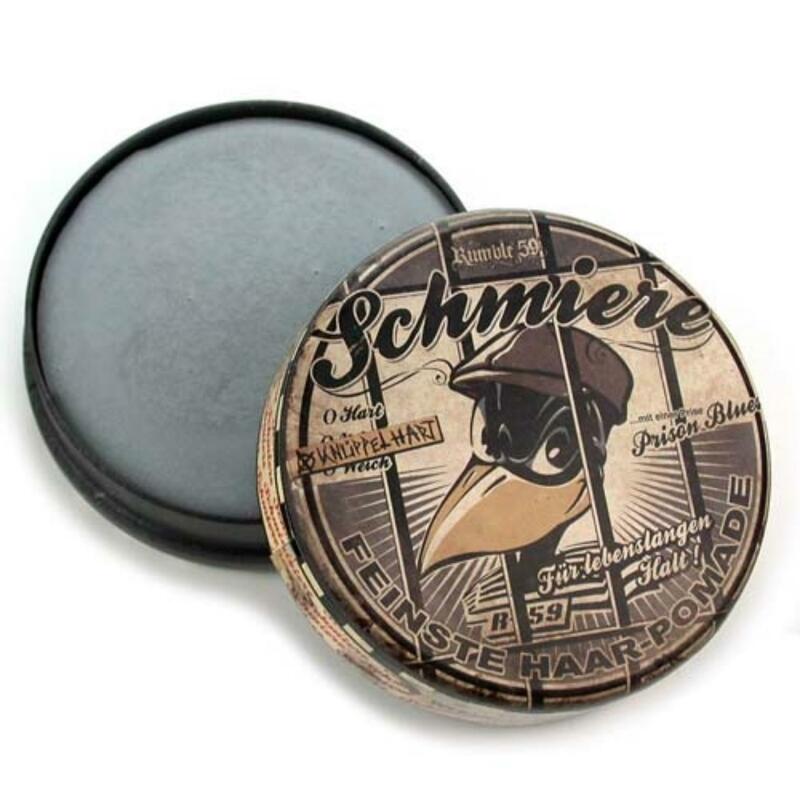 The "Schmiere - Pomade rock-hard" has a very strong hold and includes a shot of "Prison Blues". Its colour in concrete-grey and its fresh, sweet flavour reminds of the hot girls at the jailhouse laundry - your first step into freedom! It is perfectly suited to shape thick and unruly hair to a great pompadour. 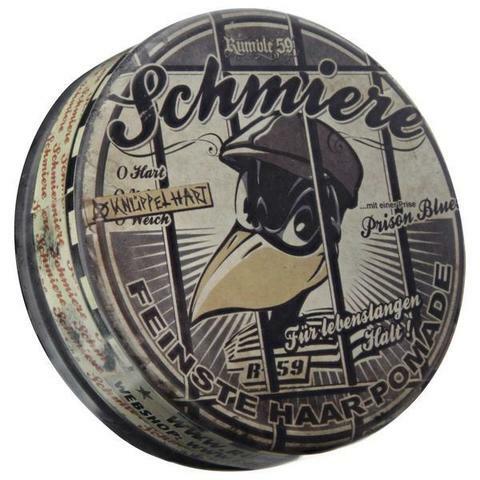 Once applied on the hair the "Schmiere" holds the whole day long without getting hard-dry. While making your hair hold all day long it stays flexible at the same time. Beginners may have difficulties to spread strong pomade over their hair. Because of the strong consistency they may be frustrated very quickly: the tough mass glue to the fingers like paste! 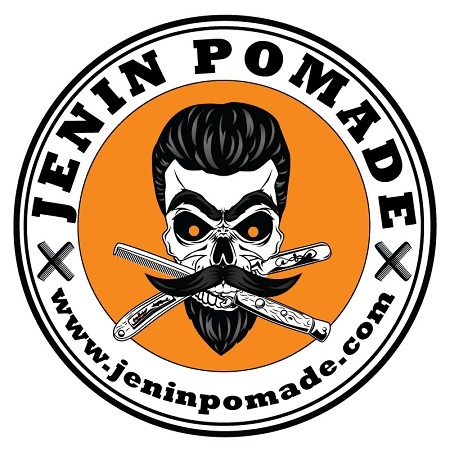 Of course it isn't easy to apply strong pomade on the hair. Tip: Preheat it with a hairdryer. 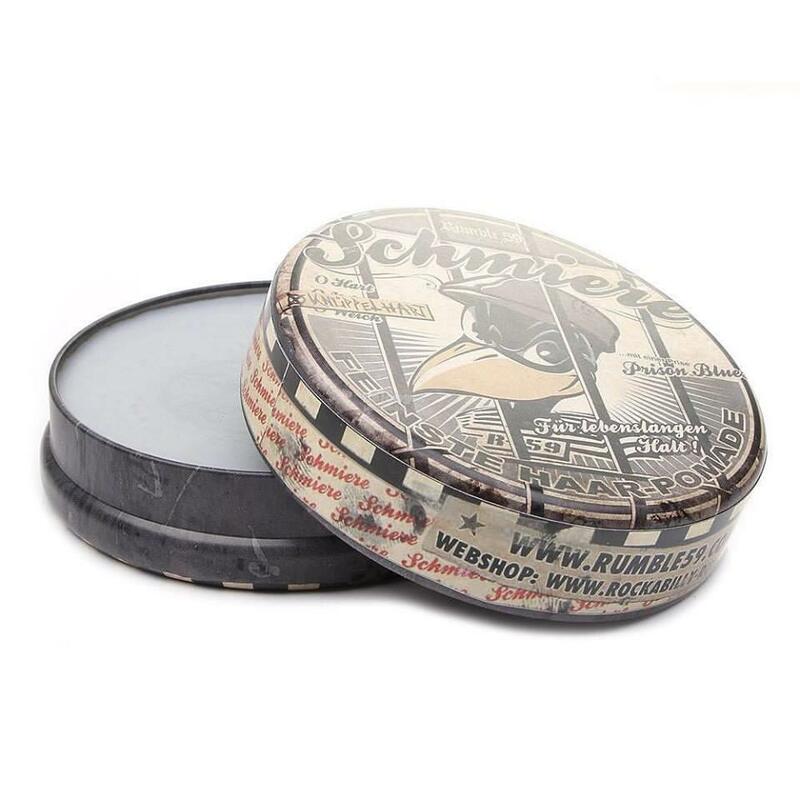 To shape the hair take 1 finger of pomade for thin hair and 2 fingers of pomade for thick, wavily hair and spraid the pomade over the palm of hand. For the beginning: less is more! You can always "regrease"! Now run your fingers through your hair. At the end, when the pomade is getting solid again, you can give your hair any shape you like by forming it with a comb.